The latest in a succession of cockpit enclosures. 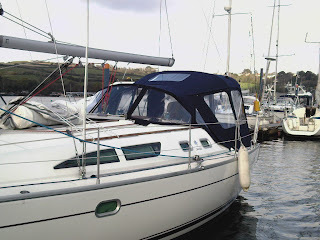 This time, the customer already had a serviceable hood made by others, to which we made alterations to improve the fit. 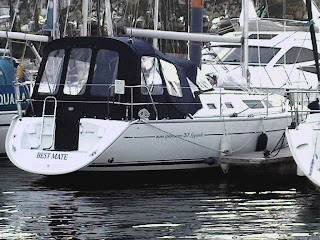 The enclosure is also designed to act as a bimini with fully zipped out side and aft sections. To use the bimini section alone the cover has been made higher, so that whoever is helming can stand upright under the bimini. There is also a window in the top section providing a good view from the steering position.